Here is a video overview of the Crocoblock suite for Elementor and a walk-through of the different installation options. The screens are shown in more detail in the video while in the article there are just screenshots taken at important points in the process. There is some information in the article that is not included in the video, but they are substantially the same. 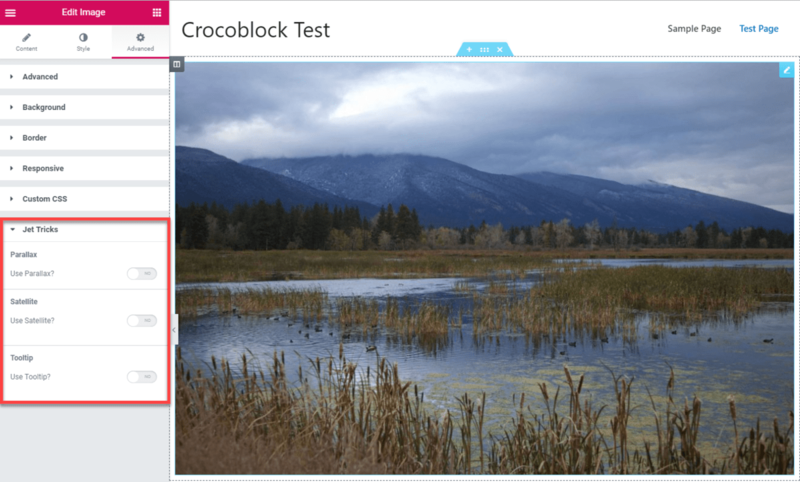 This post is part of a mini-series looking at the Crocoblock Suite for Elementor. In this first post I want to do an overview and look at the installation options. Crocoblock has been on my watch-list for a while. I’ve noticed that it is being quickly developed and has an active Facebook community. I was recently offered a coupon to take a look at Crocoblock and I’m happy for the opportunity to do so. Please note that this is a balanced review. I’m going to give you my take on the suite, the strengths and weaknesses, along with things to keep in mind, to help people who are curious about the product. Crocoblock is a suite that has a lot included. Here on their website we see that it includes a number of plugins. JetElements and JetBlog have widgets that are in line with your standard add-on packs. JetElements is a plugin that provides a number of widgets for Elementor. It is also the plugin that makes the Jet Blocks available. 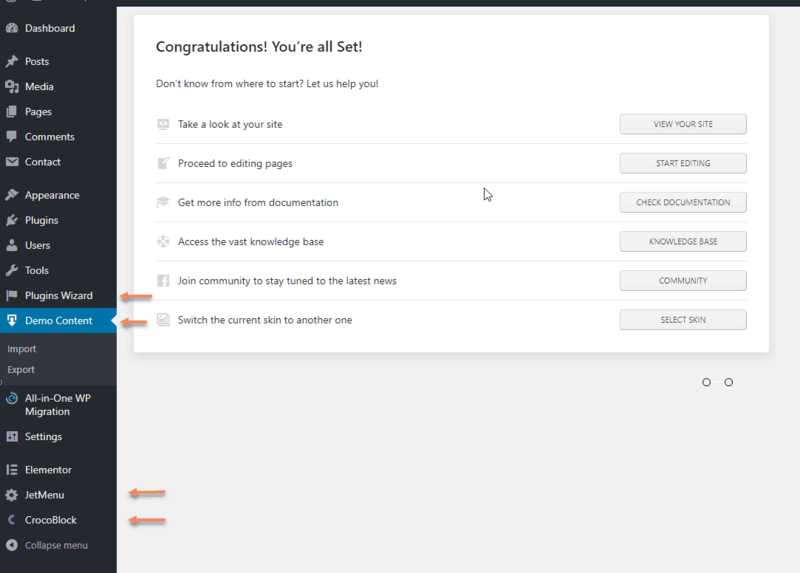 JetBlog has Elementor widgets for displaying your blog content. JetTabs gives you tabs and accordions. JetReviews has a widget for people doing reviews and adds stars and structured data. JetTricks adds some advanced styling options, such as parallax effects. JetWooBuilder if you are using WooCommerce. JetEngine, has the ability to add custom fields, meta boxes, and custom post types. 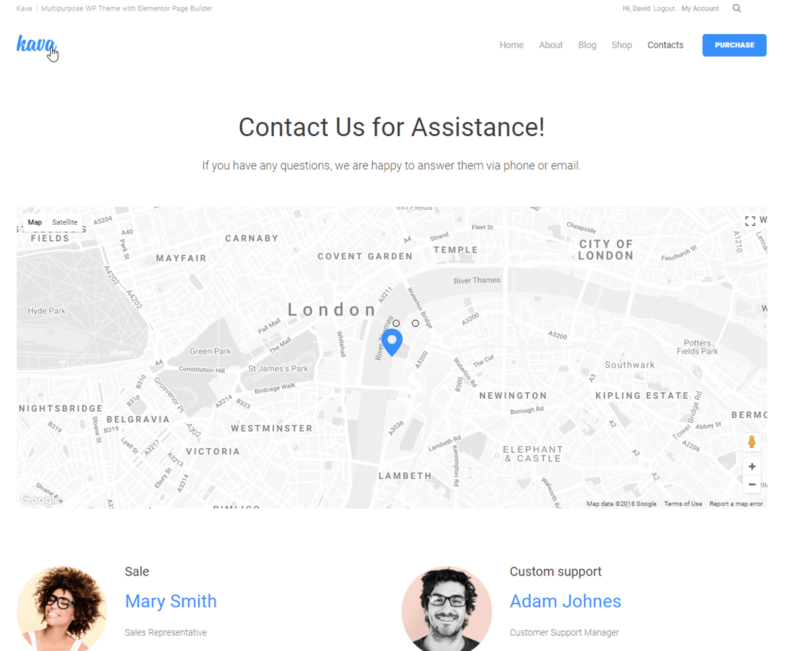 JetThemeCore add some advanced theming options such as the ability to create headers and footers and assign them either site wide or to particular pages. They have also introduced the ability to create templates. JetBlocks includes the widgets for creating a header. 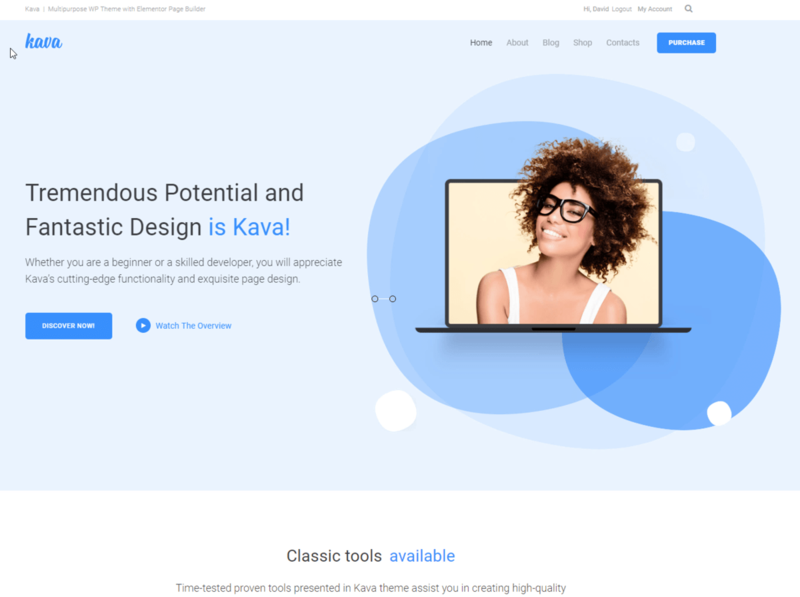 The Kava theme was designed for use with Elementor and is included in addtion to the plugins. There are more than 500 pre-designed blocks that you can use with Elementor. 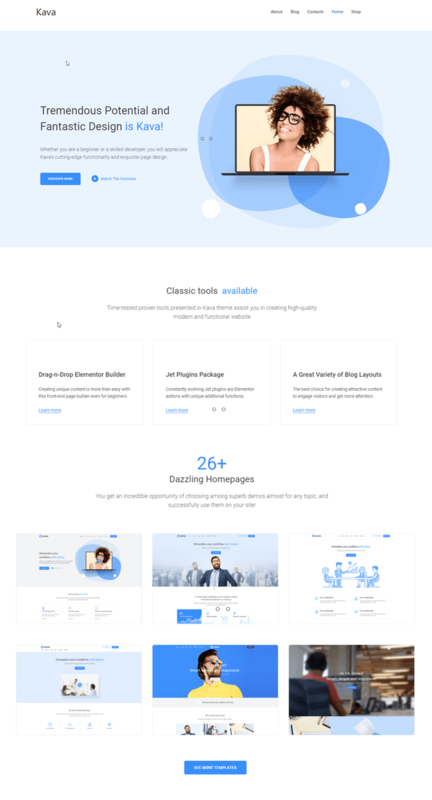 There are also a number of demos that includes pre-designed full websites that you can use as a starting point for a site, or for exploring and learning about the features. 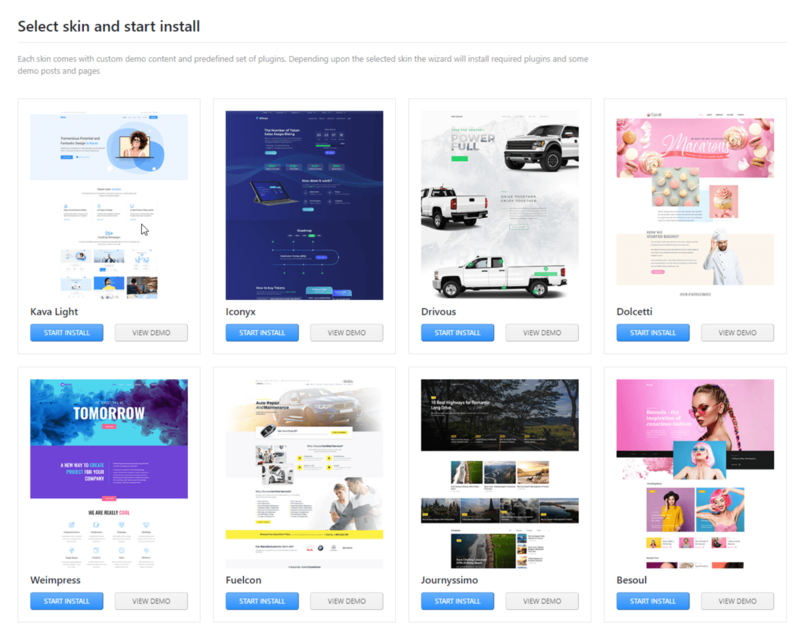 If we look at the list of plugins, we see that there are two more on the road map: JetPopup for popups and JetSocial for social media integration. The Crocoblock teams seems committed to continuously improving and expanding the suite. If we look at the pricing, we see that one website is $49 per year or unlimited website usage for $79 a year. There is also a lifetime option for $299 a year. 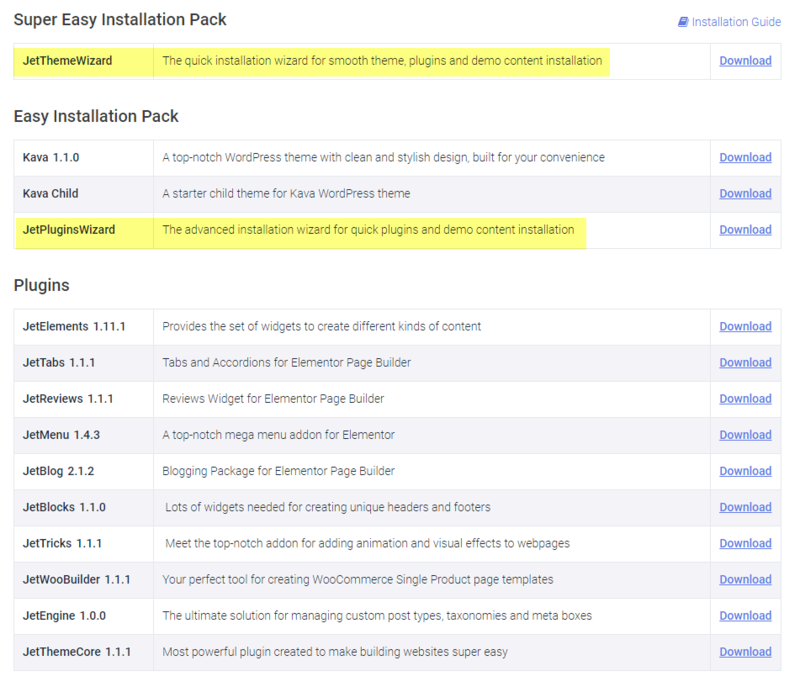 In addition to annual or lifetime packages, it is possible to purchase some of the plugins individually on CodeCanyon. These are lifetime, but only for one site, and come with only 6 months of support. Once you purchase a couple of them, it is cheaper to buy the full suite directly from their website. 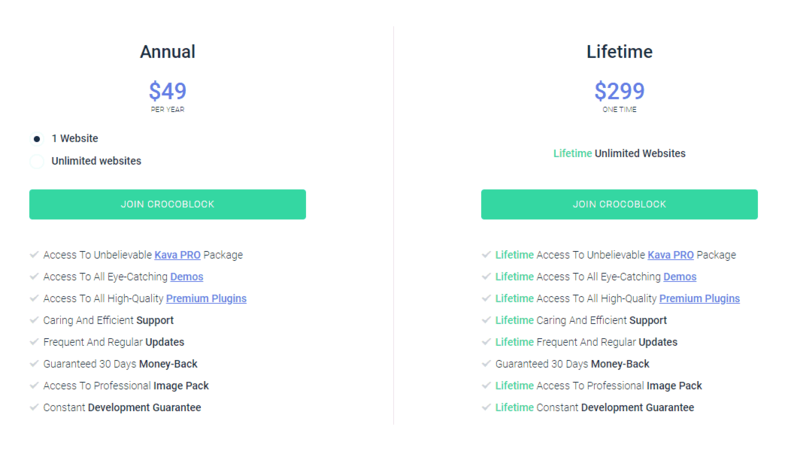 I personally would find the lifetime package the most attractive, if you can afford it, because it is a one time purchase and then you don’t have to worry about it each year. The suite comes with a 30 day money back guarantee. I read the terms and conditions and found that it is not a no questions asked policy. Rather, the money back guarantee is conditional on something not working as it should. I think they may be doing that because new Crocoblock users, people new to Elementor, or even new to WordPress, might not know how things work and get frustrated, so they want people to reach out to support before asking for a refund. While that makes a lot of sense, a no questions asked policy gives buyers more peace of mind. Once you’ve made a purchase and logged into your account, you can see the download area. 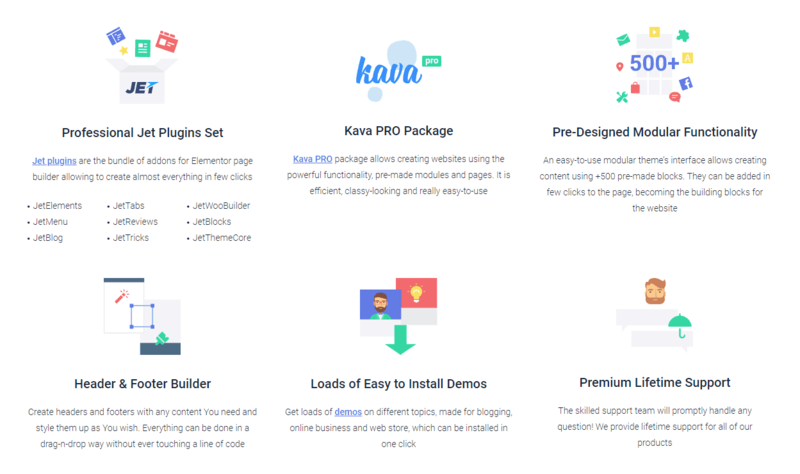 There are two plugin wizards – the JetThemeWizard, if you are planning to use the Kava theme, or a JetPluginsWizard, if you want to use a different theme. Both wizards automate the installation process and give you the ability to choose some pre-designed “skins”, which are full websites, as well as demo content. Of course you can also install the theme and plugins manually. Before we look at the installation process, I wanted to note that there are some image packages that are provided which you can download. These days you can find free stock photos on line. I have a list of sites that have public domain or CC0 licensed images here. The bonus images are curated sets by topic that you are free to use on your sites. Moving on to the installation demo, I setup a new site that is using the core 2016 theme. 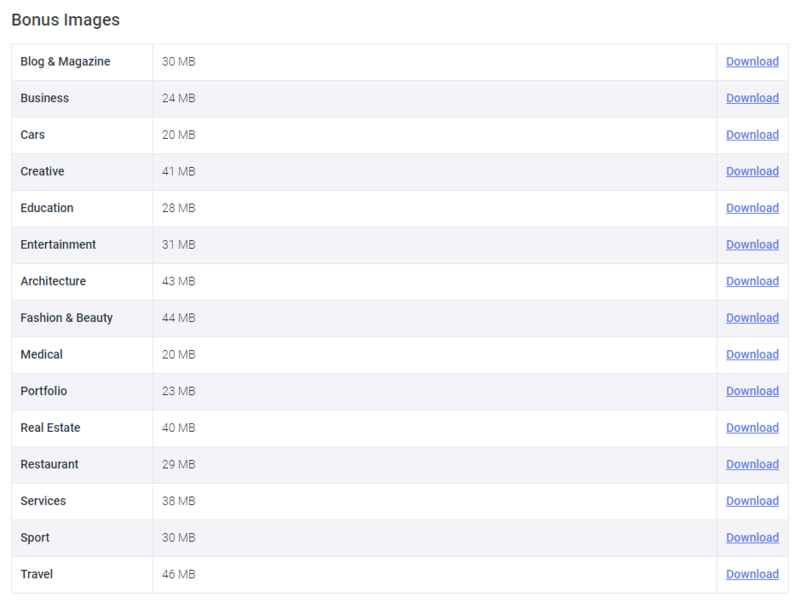 At the top, I have the All in one WP Migration plugin installed. It is a backup and restore plugin and I’m using it to reset the site between tests. The free Elementor plugin, the second in the list, is required. Firstly, people building websites professionally will want to support the Elementor team, because without a healthy Elementor, the add-on packs are worthless. Secondly, there is an entire ecosystem built up around Elementor, and these other products are made to work with the Elementor and Elementor Pro. In many cases they extend and add functionality to Elementor Pro, and of course they are not adding code to extend the Crocoblock plugins. So I think the best approach, where there is overlap with Pro, is to view those features as providing more options, but not as a replacement. Now, the first installation run-through is using the wizard that includes the theme. I’ve installed the “JetThemeWizard” plugin. When you activate it you are taken immediately to a screen to enter the serial number and then the theme is installed and you go to a screen where you can pick a “skin” if you want to install one of the demo sites. For the sake of the demo, I selected “Kava Light,” the first skin. I was then shown a screen listing the required and suggested plugins. The suggested ones may be used on the demo pages. It takes a while for everything to be installed. Once it is done, you are presented with a list of links. You can also see the new menu items in the WordPress admin. Here is a look at the Crocoblock settings page. There is a tabbed interface where you can update and install plugins. Install the theme or child theme, install or change the skin, and some settings and a link to documentation. 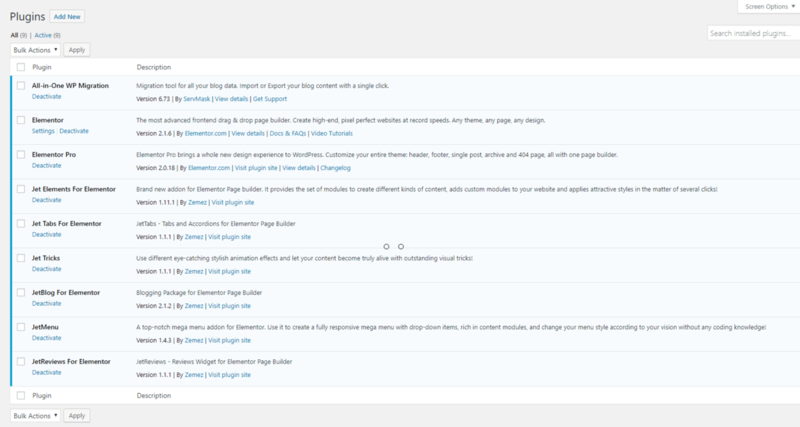 Note that you can also update plugins normally on the plugins page. On the front-end, the site looks very attractive with the skin applied. When you install a skin there are 4 pages setup: Home, About, Blog, and Contacts. Here is a screen shot of the home page. And here is a screenshot of the contacts page. I reset the site and installed the Astra theme. This time I used the JetPluginsWizard. It is similar to the previous wizard, but doesn’t install the Kava theme. I had to go into the WordPress Customizer after the installation completed, and set the Layout to full width and pages to not use a side bar. This is what the home page looked like using the Astra theme. Of course, one would want to customize the header and there is white space between the header and content, but those things are easily fixed. It is nice to know that the demo / pre-made pages work with other themes. Note that there is a comparability helper plugin available if you are using Astra, OceanWP, or Generate Press and want to use the header and footer design options of the JetThemeCore plugin. It is also an option to install the theme and plugins manually so that you are only loading the ones you need. I installed all of the Crocoblock plugins that add widgets for Elementor, except for those what involve custom post types and theming. I’m going to look at those in a subsequent video. Some of the features are added as extensions to existing Elementor widgets. For example, the JetTricks plugin adds some style effects onto the Advanced tab of the Elementor Image widget. 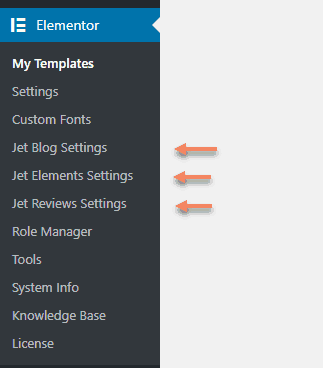 Most of the widgets added into the Elementor widget list, under the “Jet Elements” heading, are added by the JetElements plugin. However, other plugins add some of them. The ones added by the JetBlog plugin are related to the blog archive. Most of the other widgets from plugins. other than JetElements, are at the bottom of the list. The ones I outlined in blue are from the JetMenu plugin, the orange one is from JetReviews, the greens ones from JetTabs, and the purple ones from JetTricks. Another design element that the is available are the Jet Blocks. There are more than 500 Jet blocks available. You can select these the same way you would an Elementor Pro block. The JetElements plugin adds these blocks. In summary and conclusion, a weakness is the conditional money back guarantee. I haven’t heard of anyone having an issue with it, but it gave me pause. That is something the company might want to consider revising. Also, there tend to be a number of menu items in different places in the admin. I imagine this is because the plugins were developed separately over time, but now that everything is included in a suite, it could be tidied up without removing any functionality. I’d also recommend viewing any of parts of the suite that overlap with the Pro version of Elementor as extra options and not replacements for the Pro features. The strength of the Crocoblock suite is the large number of plugins included. There are a lot of Elementor widgets added that extend the Elementor products. The large number of pre-designed blocks and attractively designed “skins” are also strengths that many users will enjoy. It is a very full featured offering. I have not yet explored the Kava theme yet. 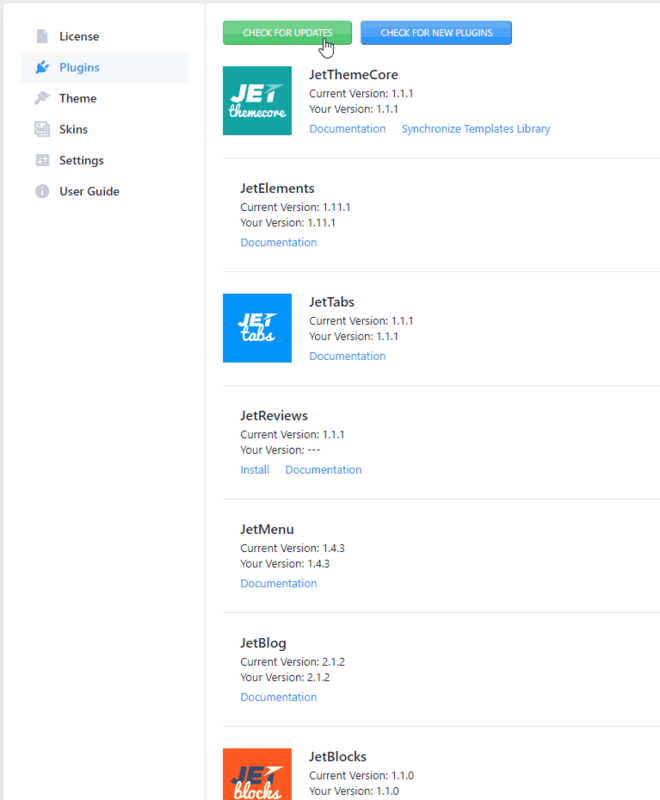 I also want to dive into the JetEngine, JetThemeCore, and JetBlocks plugins. Those will be covered in subsequent videos. Thank you for reading. I hope this article was helpful.